Omaha Computer Repair – Thank you! Did a computer repair service call last week for Accurate Locksmith’s in Omaha, NE. 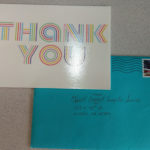 The customer sent a thank you card which was really appreciated. Thank you… for the Thank you!! !